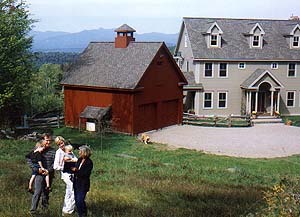 Judy Foregger has over 20 years' experience listing and selling real estate in the Stowe and Waterbury Vermont areas. Here aresome of her suggestionsfor selling your home. Please contact Judy today for a free consultation. 1.) Your front door or mudroom gives a vital first impression. Be sure it and the porch entry are scrubbed clean or painted if necessary. 2.) If any decoration is needed (especially kitchen) do it now! Paint and fix-up may balance a price cut. Bathrooms help sell homes. Make these rooms sparkle. 3.) Illumination is like a welcome sign. Glowing lamps in dark areas help leave a good feeling with buyer. 4.) Wash dishes, put away clothes, straighten up newspapers, etc. 5.) Keep clutter to a minimum. Your home should seem spacious. 7.) Keep pets out of the way when showing. 9.) Don't discuss details concerning the sale with the customer. Let the realtor discuss price, terms, possession, and other factors with the customer. They are qualified to bring negotiations to a favorable conclusion. 10.) Never apologize for appearance. It only accentuates or distracts.